In a large skillet brown the beef with the onions and garlic until beef is cooked and onions are tender. Add the broth and wine, simmer for 15 minutes. While the beef mixture is simmering cook your noodles according to the package. Add sour cream to the beef mixture and heat through but do not boil. Serve over the pasta. I serve mine with some fresh Italian bread on the side. I have not had beef stoganoff in so long! My mother always made it and it was soooo good! Thanks for the recipe. I've just started making a homemade beef stroganoff! The recipe is a good bit different from yours, but delicious! I will have to try your recipe soon! 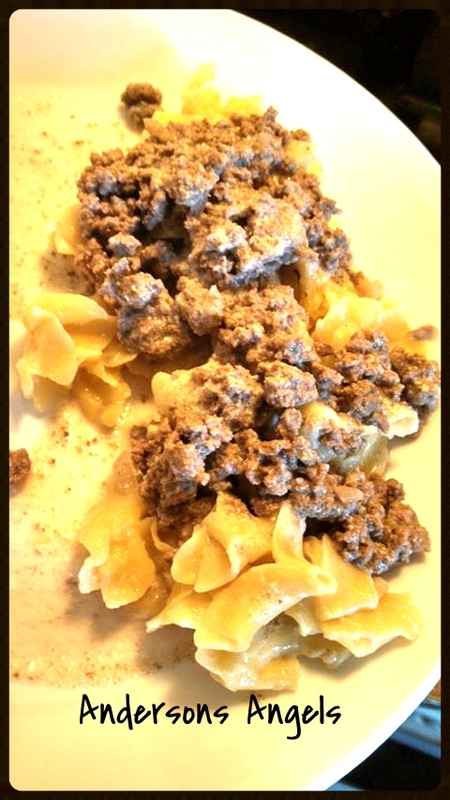 I have a beef stroganoff recipe I make a lot, it looks similar to this. YUMMY! That looks sooo good! I haven't ever tried home made stroganoff, this is defiantly on my list of to try! ReallY!?! Beef Stroganoff is this easy to make?!? I had no idea - we always do the crappy kind from Hamburger Helper... I would love to try this. Thanks so much for sharing.